Cut-stamps were born since old times. Someone thought to cut the stamps to obtain the correct rate. During the Second World War, this trick was often used because the lack of stamps. So if you wanted to obtain a 25cent. stamp, you were to halves on of 50 cent. This trick was not authorized by the Postal Authorities, but It often was tolerated. In some case they themselves used It. Postal history affranchised with this kind of stamps is usually very scarce, It depends from which stamp was cut. Below are showed some covers affranchised with cut-stamps. Some Postal Offices too were affected from tha lack of stamps, so to tax some covers was necessary to cut stamps to obtain the correct rate. The pictures above shows a 1 Lira Postage due stamp cut. Therefore the correct rate obtained was 50 cent. 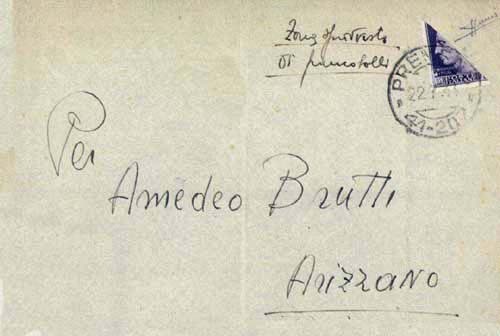 The cover above showed was sent from Genoa to Stra ( Venice ) on January 1945. Since October 1944, the rates doubled from 50 cent. to 1 Lira, so that cover was under-affranchised and taxed for the double of the lacking rate, that is 1 Lira. The rate was obtained cutting a 2 Lire Postage due stamps. The " Fascetti " themselves were not saved from this destiny. The image above shows a 75 cent. cut. The correct rate was 30 cent, so this cover was over-affranchised of 7,5 cent. Very scarce is the 75 cent " Tamburino " ( Destroyed Monuments set ). Similar to previous, this card was over-affranchised of 7,5 cent. A classic cut-stamp is showed on the cover above. To obtain a correct rate of 50 cent, a 1 Lira stamp was cut. That stamp is the 1 Lira belonged to a Imperiale set, issued on 1929.